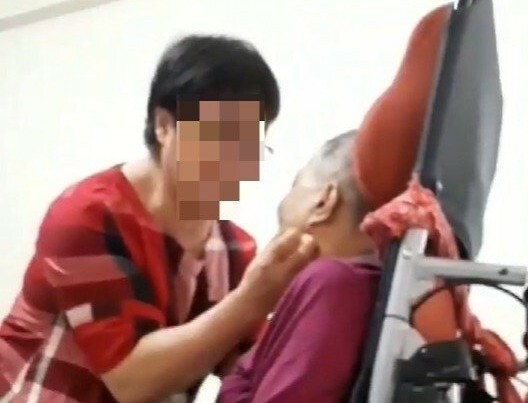 TAIPEI (Taiwan News) -- A Filipina caregiver has released video on social media of a Taiwanese caregiver cursing, slapping and choking an elderly disabled patient. Early this morning, a Filipina caregiver with the Chinese surname of Lu (呂) uploaded two videos to the Facebook Group Breaking News Commune (爆料公社) showing a Hakka-speaking Taiwanese caregiver curse, choke, slap and kick an elderly woman in a wheelchair. Lu told UDN that the video was shot when a colleague took her to Taichung's Dongshi District to take over for a Taiwanese caregiver, who was responsible for providing care for an elderly woman surnamed Liu (劉), who was wheelchair-bound and wearing a nasal cannula. 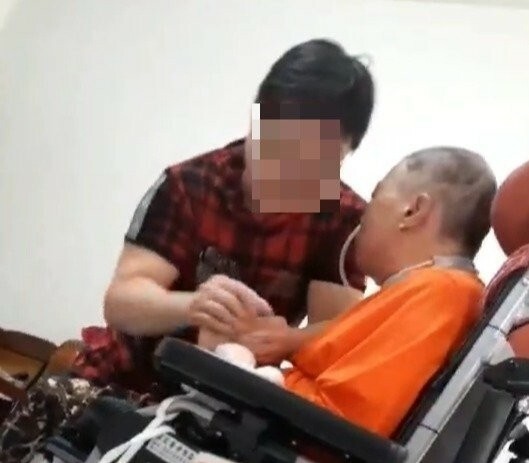 The Taiwanese caregiver began demonstrating the "procedures" for caring for Liu, but the Filipina caregiver quickly came to the conclusion that her Taiwanese counterpart's behavior was a clear case of abuse. 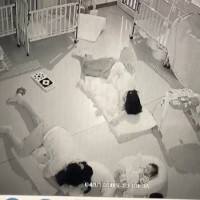 The Filipina caregiver refused to take the position and instead secretly videoed the abuse the Taiwanese woman dealt out on her helpless patient, before posting the footage on various social media groups to seek help for the "grandma." The first video, which was filmed on Sept. 25, starts with the Taiwanese caregiver cursing in Hakka and saying "still running to another person's house to eat." She then slaps Liu in the face and as she tries to lift her hand up, the caregiver grabs it and twists it back down. Liu makes a moaning sound and the caregiver slaps her in the face. The patient moans again, only to be slapped again and have her hands twisted back down. Liu then tries to kick the caregiver to release the grip she has on her wrists, and her tormentor shouts in Hakka "don't do that." The invalid woman then tries to kick again, and the caregiver shouts "Come on! Kick it again, come on, kick it again! I am waiting for you! In fact, I will bend your fingers, come on, say it again!" The caregiver then forcefully kicks her patient's feet at least four times. In the second video, which was filmed on Sept. 26, the caregiver can be seen squeezing Liu's neck and grabbing her clothing. She then says "You want your mother? You talking about your mother again? Your mom, talking about your mom again! Cry, cry, cry all day long you cry, cry, cry, complaining about this and that!" The caregiver then grabs a piece of tape, possibly meant for the breathing tube, and slaps it over Liu's mouth so she can no longer speak. 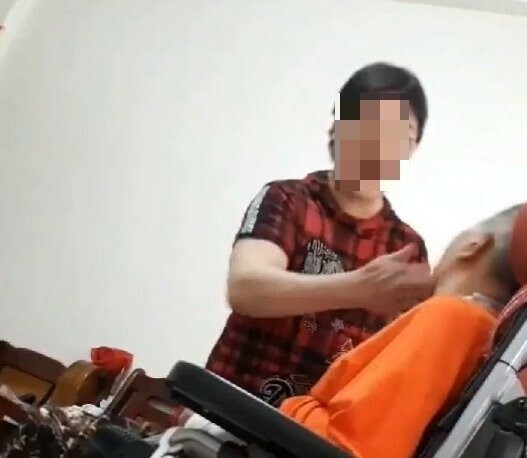 When posting the video, Lu wrote "The auntie who is abusing this grandma is Taiwanese, every day she makes NT$2,000, and yet she beats and tortures a patient..." Lu said that the nursing home where the incident occurred was located on Zhongtai Street in Taichung's Donshi District. Lu warned others by saying, "If anyone sees this auntie at the Taichung Hospital, remember not to ask this person to be caregiver." Lu also posed several questions, including, "Are you taking care of the patient or are you torturing a patient? Who is the person standing next to her and talking? Why didn't they stop her from acting in this way? Media and government departments, please investigate this!" 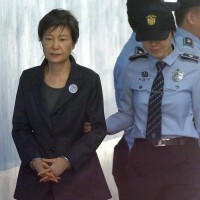 UDN cited a source as saying that the elderly victim had never married and the caregiver had been hired by her nephew. 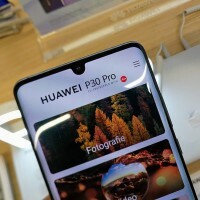 They added that it is his wife who is standing just out of frame doing nothing to stop the abuse in the video. 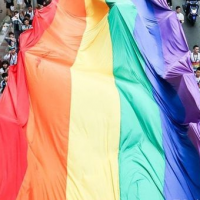 When staff from the Department of Social Welfare came to investigate, they found that the violent caregiver was a distant relative and a retired nurse, reported Apple Daily. 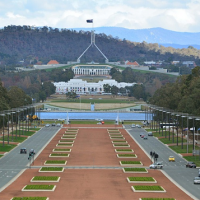 Family members claimed that she "volunteered" to provide care without receiving any payment. A sister-in-law of Liu told Apple Daily that she had been in a bad car accident four years ago and had become paralyzed and needed to be fed through a feeding tube. The relative said that her husband had helped take care Liu until he had heart surgery last year. 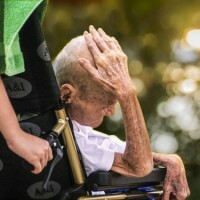 A foreign caregiver was hired to take care of Liu, but the family was not satisfied with her performance and asked a cousin to care for her instead. She estimated that the footage was shot about a month ago and said, "Everybody should stop filming, it might make our cousin stop caring for her. I can't take care of two people myself." Because the caregiver behaved cruelly, the Department of Social Welfare will continue to monitor the situation. 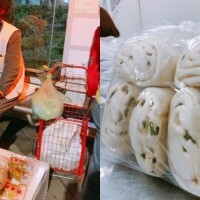 They said that if the cousin continues to take care Liu, she must receive family education and a nursing training course. 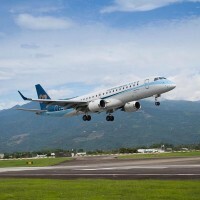 If they do not see any improvement in the situation, they will file a protection order or apply for resettlement for Liu, according to the Apple Daily report.